I mentioned to a friend the other day that we were going to make another short documentary film about fracking, a kind of "FRACKING 101" for people who had heard about fracking but didn't really understand it. "Great," he said, "That's exactly what I need!" Apparently, he's not the only one. Almost half of the people in New York say they don't actually know what "fracking" means. Even some people who have watched our two latest films, No Second Chance and On Faith and Fracking are left with questions about this new technology. So this summer we'll be on the road again, shooting, interviewing and editing, to help more people understand what "fracking" means, and why the issue is so important. In politics, the only thing more powerful than money is public opinion. And make no mistake, the battle over fracking is all about politics. 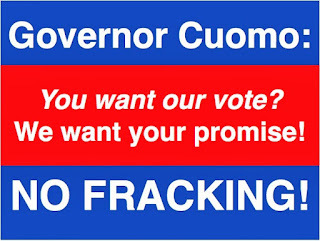 Ultimately, Governor Cuomo's decision about whether or not to allow fracking in New York will be driven exclusively by public opinion. Patti came up with a brilliant idea for a slogan the other day: "You Want The Vote; We Want The Promise." Watch for the signs this fall! 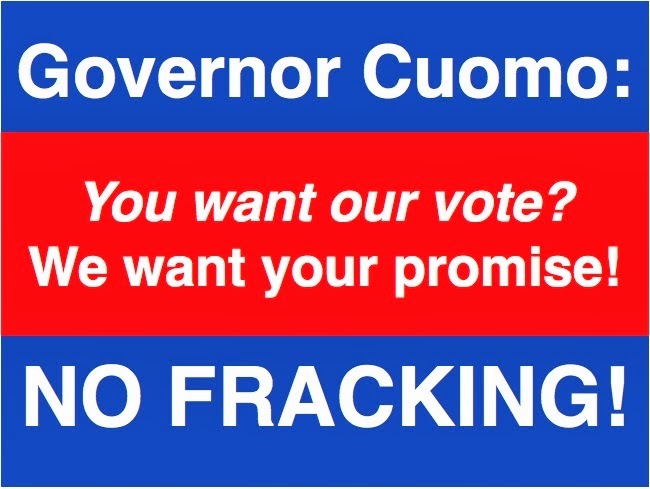 If we expect to win the battle over fracking in New York, we're going to need to win the public opinion battle. This means talking to your neighbor, your family and your co-workers. Ask your priest or rabbi or minister to watch On Faith and Fracking and share it with your congregation. Ask your local town or county officials to watch No Second Chance. You have to hand it to the marketing folks at the energy companies. They really understand the power of words, and how to manipulate public opinion by attaching positive-sounding adjectives to dirty old industries. The phrase "Clean Coal" comes to mind. How did coal get clean? you might ask. Well, it didn't. There is no new technology, no magical discovery that has made coal a clean fuel. Someone at an ad agency just wrote those words down on a yellow pad during a meeting one day, and before long, it became the mantra of the beleaguered (and still dirty) coal industry. 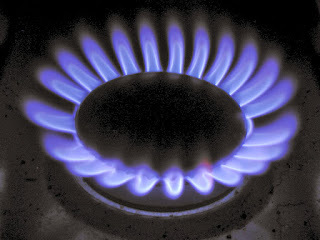 "Natural Gas" is another one. The gas coming up out of the ground today is no more natural than oil or coal. It just sounds better than plain old "gas." And much better than "methane," which is what it really is, technically. The word "natural" conjures up images of wheat fields swaying in the wind, bucolic mountain streams and clear blue skies. It taps into the subconscious, encouraging us to think of this gas as special - and therefore better than other types of fuel. Nothing could be further from the truth. Let's be honest about it: the extraction of natural gas is a dirty, polluting, dangerous, climate-changing but enormously profitable enterprise that is making a few people very rich while it wreaks havoc on our environment and the health of our citizens. It is poisoning our air and water, leaving a toxic, radioactive legacy that will burden hundreds of future generations. How is any of that natural? America's gas boom has nothing to do with energy independence. It has nothing to do with addressing climate change or lowering energy costs. It has everything to do with Wall Street, with speculators, with political payoffs and with profits for gas companies, who are hoping to cash in quick before the public wakes up and understands that something very unnatural is going on.